Frankfurt | Reuters — Bayer is considering job cuts and outsourcing as part of a wide-ranging review of drug research and development that will last until at least November, a person familiar with the company told Reuters. The prospect of “very tangible changes” contributed to a decision by key board members to extend the contract of Hartmut Klusik, the 62-year-old head of personnel, which was due to expire at the end of the year, the source said. That decision is due to be signed off by the full board in September. The savings that Bayer — the inventor of Aspirin and maker of Yasmin birth control pills — could make as part of the overhaul would give it financial wiggle room as it competes with larger rivals to buy the right to promising treatments from biotech firms. But any major external expansion is unlikely until after the review is complete, the source said. A company spokesman declined to comment on Klusik, any potential job cuts or outsourcing. An extension of Klusik’s contract had been in doubt, two sources familiar with the company said. 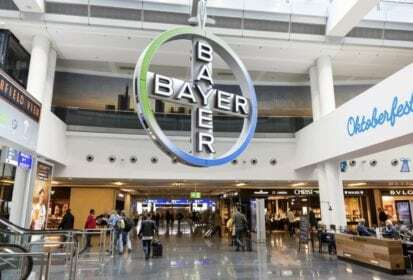 This is because drug production at Bayer’s Leverkusen plant in Germany was found to be substandard by U.S. regulators in February and this fell under his remit. Bayer has said it launched the R+D review — starting in January when drug development head Joerg Moeller was given additional control over research and discovery in January — to “seamlessly steer” R+D activities. A new team reporting directly to Moeller has just been appointed to help map out the new setup, a third source said. The review will look at whether drug testing services should be outsourced to cheaper contractors. Labour representatives, who are worried about jobs moving outside the company, are involved in the talks, the first source said. After Bayer’s US$63 billion acquisition of Monsanto, which was concluded June 7, profits depend equally on farming supplies and pharmaceuticals. Without an upgrade of the drugs pipeline, analysts say the balance could swing in favour of the agriculture unit. Revenues from the drug unit’s top products, blood thinner Xarelto and eye drug Eylea, will peak over the next six years. “That gives Bayer a window of one two three years to licence something in and, if not, to show that something is yet to emerge from its earlier-stage pipeline,” said Frankfurt-based fund manager Markus Manns at Union Investment, who holds Bayer shares. Analysts say a better pipeline is crucial to preserving the independence of a pharma business that ranks 15th place among global peers, with about half the revenues of top three, Novartis, Pfizer and Roche. “If Bayer consisted only of its pharma division they would certainly be an attractive takeover target and would probably not prevail on a standalone basis,” said Manns. The sources said that CEO Werner Baumann and chairman Werner Wenning’s push to acquire Monsanto was meant to render Bayer immune to unwanted overtures from larger pharmaceutical rivals. The Bayer spokesman declined to comment. Bayer has said its six most promising experimental treatments had an annual peak sales potential of at least six billion euros. CEO Baumann said in May that, with 50 projects in the clinical stage, pharma development was well positioned. Investors have said Bayer’s November deal with Loxo Oncology to jointly develop cancer drug larotrectinib, was a step in the right direction. A number of drug development projects fell short recently, including a trial on drug anetumab ravtansine against an asbestos-linked type of cancer and a bid to widen the use of prostate cancer drug Xofigo. Other problems are also piling up for CEO Baumann. These include the prospect of years of lawsuits against Monsanto, the order by U.S. regulators to fix production problems in Germany and weak sales of consumer healthcare products. Financial firepower for expansion is limited. Standard + Poor’s cut its credit rating to triple-B in the wake of the Monsanto deal. Bayer has said it will pay back debt to return to a single A rating. — Reporting for Reuters by Ludwig Burger and Patricia Weiss; additional reporting by Matthias Inverardi in Duesseldorf.